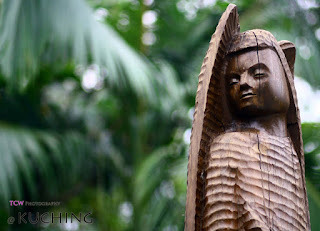 Hi Everyone, wanna share out some photos ( Food, Interest Places and Building) taken at recent Kuching free n easy tour. 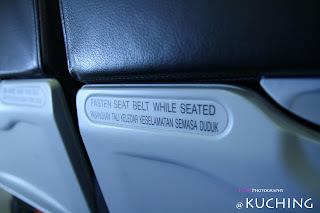 We (me,my wife, edwin, parent in law) left from LCCT (airaisa) 09aug09 early flight at 7.10am and reached Kuching at 9.10am(2 hrs flight). We are excited because this is our 1st time visit to east Malaysia. Below photos were taken on the flight. Typical local Kuching food are Kolo Mee, Sarawak laksa, Jawa Mee and Sarawak Coffee. I like their Kolo mee( like wan tan mee at west Malaysia) and Sarawak laksa. 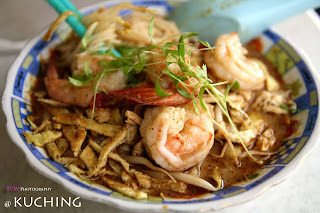 The most famous Kolo mee and Sarawak laksa stalls are Chong Choon Cafe (Jalan Abell) and Choon Hui Cafe(Ban Hock Road). Both cafe serve Kolo mee and Sarawak laksa as well. 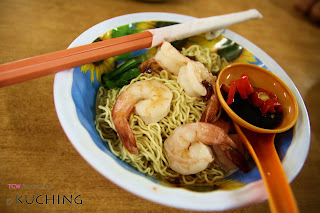 Surprising me is their Kolo Mee is serve with fresh prawn and when you order please state you want a 'Special Kolo Mee'. The price is different but it will definitely satify your appetite. 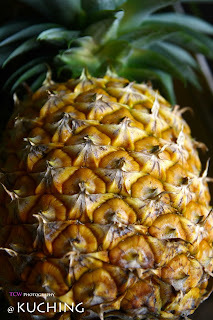 The Sarawak Pineapple is also one of my recommendation as it is sweet and juicy. 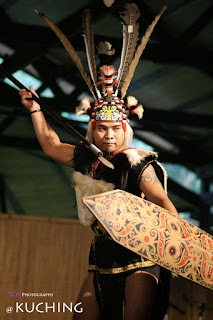 We went to the Sarawak Cultural Village on 2nd day early morning which is 45 min drives from Kuching Town. Adventurous experience as we are using the only photocopy of map and a non complete GPS map(hope Malaysia tourism will improve that). We have been asking around on direction and lucky enough the people around is so kind and helpful. 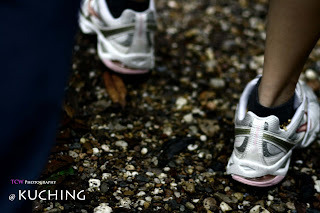 Along the way you can enjoy beautiful scenery and the atmosphere is breezy. Following the signboard to Santubong and Damai Beach you will passby some seafood restaurant around the corner. We reached around 9.00 am and and friendly welcome smile from the customer service at Cultural Village. We are given a passport book which you can stamp later when you visit the 7 cultural house which contains of houses of orang Iban, Bidayuh, Melanau, Penan, Ulu, Melayu, and Cina. We are well entertain by their short cultural dance at each houses. 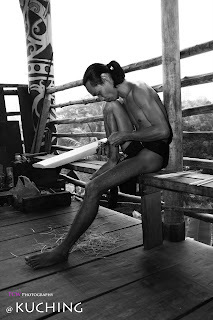 There is culture show at 11.30am and 4.00pm each day for 45minutes. You able to enjoy all the combine traditional culture dance. Overall we love their surrounding landscape and countrysite feelings. The next itinerary after the cultural village is Semenggol Orang Utan. We need to reach this place before 3 pm as their feeding time is at 9 a.m and 3 p.m daily. 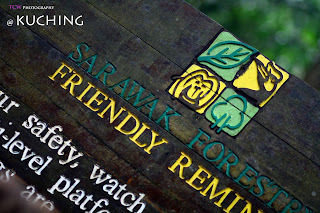 You need to passby Serian and is about 1 hr drive from town and is at Sarawak Wild Life and Research Centre. Amazing experience as we need a short jungle trekking about 200m to see the feeding and Orang Utan is freed and independence at the jungle. 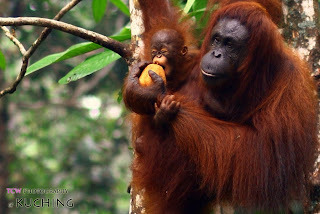 There is photos and information on the family of Orang Utan and description from the researchers. ChinaTown is combine with heritage and new shoplots buildings. You can find variety of local food there. During the mid month of July till Aug which is once a year, there is a Kuching Food Fair nearby which you can find all the restaurant and small eateries of Kuching all under one roof at this fair. This is also focal point for Kuching resident once a year. You can find any range of food from fried, steam, baked and grill style. We have tried Shanghai steam bun, fried pigeon, grill fish, fried oyster and okonomiyaki. For those who need to buy souvenirs Main Bazaar street near Chinese Museum is a great place for bargain. I fully recommend 'Poh Huat shop' on it marked down and reasonable price. 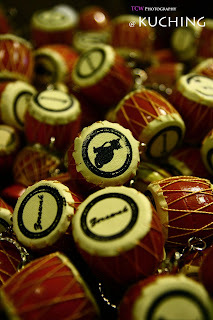 You can find all sort of handicrafts, key chains, batik and kuih lapis. 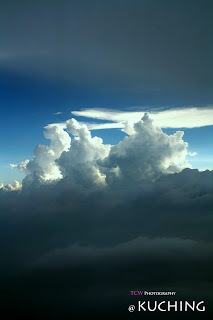 What a wonderful 3D2N free n easy trip. Enjoy, enjoy and enjoy!